“From the stage to the page”. Based on the Australian Ballet’s 2015 production of this iconic ballet in which Creative Director David McAllister wanted to preserve the original choreography by Pepita “while introducing modern pacing and narrative logic” this is a ballet lover’s must-have. Following the traditional story with no Disney additions in sight, the story of Aurora, Carabosse, the Lilac Fairy and the handsome prince is told in simple narrative, accompanied by the most exquisite illustrations created by Gabriela Tylesova who was also the designer of the stage production. In all the shades of grey and pink all the characters have a magical quality filled with intricate detail that makes their balletic movements jump off the page. You can see the ballet and hear the music, even in the silence of awe. From the intriguing front cover to the stunning back one, this is a book that will needs to be in the ballet-lover’s collection as well as that of anyone who just likes beautiful things. It thoroughly deserves its CBCA 2018 Notables nomination. This entry was posted on March 9, 2018, in Ballet and Dance, CBCA Shortlist/Notable, Fairytales, Fantasy, Illustrative Techniques, Magic, Picture Book, Review, Traditional Tales. This is a story that will appeal to all those who aspire to being the Sugar Plum Fairy one day with its gentle but realistic storyline and charming watercolour illustrations. For those who are familiar with the story of The Nutcracker it takes on a new dimension and for those for whom this is new, not only will it help explain the prevalence of nutcracker decorations in stores at this time but it will also lead to one of the classic Christmas time stories, and perhaps even a performance of the ballet! Worth tracking down for the ballerina who likes to read! This entry was posted on December 23, 2017, in Ballet, Ballet and Dance, Christmas Countdown, Christmas Story, Emotions and Feelings, Girl Appeal, Picture Book, Review. Over 140 years ago, Pyotr Ilyich Tchaikovsky brought a story about first love, betrayal, loss, and good versus evil to life through a musical score he called Swan Lake. and on March 4 1877 through the choreography of Julius Reisinger and a few years later that of Marius Petipa and Lev Ivanov that music was interpreted through dance, laying the foundations of one of the most loved and enduring of the classical ballets. Now, in 2017, it has been reinterpreted through the stunning artwork of Anne Spudvilas. With a synopsis of each act to explain what the reader is going to experience, the story unfolds in pictures that echo the dark, hazy, haunting mood that permeates the story – the lake at midnight, the malevolence afoot at the Grand Ball, the storm that accompanied Siegfried’s battle with the Sorcerer and the final tragic ending. Dramatic in their composition and demonstrating how many shades of grey there really are, Spudvilas has captured the essential elements of the story while also portraying the atmosphere that the music and choreography bring to the experience. For those who are unfamiliar with Swan Lake as a ballet it is a complete sensual experience in itself; for those like me (and Spudvilas) who have been entranced with it since childhood, it is yet another layer adding to the wonder and love of the original. While the long-ago LP record cover that took me into a lifelong love of ballet in general and Swan Lake in particular has disappeared forever, this new interpretation will be a suitable substitute and will join the other members of my treasured collection that brings back such happy memories. And even though I know I will only ever be Odette in my dreams maybe it will spark a dream for my granddaughters! This entry was posted on November 7, 2017, in Ballet, Ballet and Dance, CBCA Shortlist/Notable, Classic, Fantasy, Illustrative Techniques, Music, Older Readers, Picture Book, Review, Supernatural, Wordless Text. The ballerina lived in a little wooden box and every day she stood straight and tall and danced for the little girl who would laugh and clap her hands and dance like the ballerina herself. But as the years passed, the little girl grew up and the ballerina danced for her less and less, until, eventually, she danced no longer. This is a poignant story about growing up and the treasured keepsakes we grow beyond as we do so. For while it is the story of the ballerina wanting to do what she loves, it is also the story of those things that we always think of when we think of our childhood and which we know we will pass on to our own children in the hope they will get similar joy. Gwynneth Jones’s illustrations are charming – gentle pastels while the ballerina is happy dancing for the girl and a bolder palette as she gets bolder – and feed right into the vision we have when we think about musical boxes with their magic tucked inside. A great opportunity to talk about memories with our children as well as what they love enough to want to keep for their children, creating bonds across generations. This entry was posted on October 26, 2016, in Ballet and Dance, Girl Appeal, Growing up, Picture Book, Review, Teddies and Toys. Ada does not look forward to weekends, particularly Saturdays, because Saturday is ballet day and she HATES ballet. Her leotard is too tight and her tutu too itchy and as for the moves she is forced to do and practise and practise…as she says, “Arabesques are GROTESQUE”. As for pirouettes – well! Even with her little monster sidekick who tries to offer support and encouragement, she just doesn’t like it. For Ada, it is definitely NOT a case of “practice makes perfect”. But one Saturday morning when she is trying to please Miss Pointy she pirouettes right out the door and into a whole new world, one where she fits perfectly. Across the world, Saturday mornings see young girls and boys going off to do things like ballet and music and sport and so on because their parents think they should, or they should enjoy them or the parents are reliving their dreams, but how many are like Ada and have no aptitude or passion for the activity? Many were the freezing mornings I cycled many miles to piano lessons thinking of excuses for not having practised until my long-suffering teacher told my mum she was wasting her money. 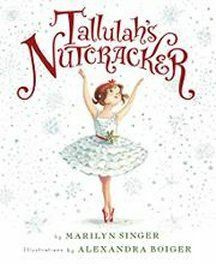 Based on the creator’s one disastrous attempt at ballet when she was four, this story will resonate with those whose abilities, talents and interests lie beyond those that they are expected to do. The illustrations are very expressive – even the youngest non-reader can tell that this is a story about an unhappy child who seems to have a permanent scowl and for all their apparent simplicity, the feelings of Miss Pointy and the other girls are very obvious. With a predominantly gentle colour scheme, lime greens and bright reds punctuate Ada’s discomfort along with speech bubbles and onomatopoeia giving it a fast pace that will encourage young readers to read it for themselves independently without much trouble. The final page is perfect. Sharing this with a class could enable a discussion about the sorts of things that the students do on weekends and their feelings about those activities. There may be a number of Adas uncovered who will be grateful for having their feelings legitimised and perhaps even have the courage to talk to their parents about what they would really like to be doing and lerning. This entry was posted on October 25, 2016, in Ballet and Dance, Belonging, Emotions and Feelings, Girl Appeal, Picture Book, Review, Self Esteem. On the surface this is a most charming story beautifully illustrated by one of my favourite illustrators, perfect for preschool with its simple text, colour and movement. But it has the potential to be so much more if the reader starts to explore the concepts of movement, wind patterns and shadows and how they change. The ending also offers scope for discussion. One of the reasons I love Oktober’s illustrations is her eye for detail and these are no exception. Bilby is very appealing yet very realistic while the meticulous detail of the contents of the willy-willy contrast perfectly with the ballet shoes on the emus! Can’t wait to share this with Miss Nearly 5. This entry was posted on March 3, 2016, in Animal Stories, Australian, Ballet and Dance, Picture Book, Preschool, Review. Three or four times a week, Eleanor Irvin and her friends attend the Silver Shoes Dance Academy to learn to dance. Jazz, tap, ballet, hip-hop, ballroom, lyrical – whatever the style it’s on offer and each girl has her favourite genre although they are also challenged to go beyond their comfort zone and take on new challenges. This is particularly true for Riley in Rhythm and Blues when Riley takes on the role of being Miss Caroline’s personal assistant. Having sprained her ankle playing tennis and forced to take a break from dance, Riley finds sitting at home on the couch really frustrating so this new position will at least get her back into that realm again. But trouble is brewing because she finds she has access to private information and power to use it that threatens her friendships. On top of that, she is so determined to get back to dancing that she risks making her injury worse and causing permanent damage. Similarly, Paige is challenged in Studio Showdown when she is asked to choreograph the Under8/9s’ item for the end-of-year concert with her friend Ellie. The theme is ‘Hollywood glamour” and while Paige is intent on it being jive-based, Ellie has different ideas. Rather than letting the younger dancers shine, she wants to be able to be the star with a support group. It looks like the team is going to be 90% Ellie and 10% Paige and Paige has to dig deep to find the confidence to have her voice heard. As usual each book has information about the featured genre and a full glossary and because the author is a dancer, dance teacher and choreographer herself you know they have authority. Miss 9 was especially excited that Santa had managed to get his hands on some advance copies of these two new additions and it is certainly a series that never stays on the shelves. The reserve list for new titles is always long. Even though dance of some sort is the second most popular sport in Australia with over 4 000 000 participants, not all who would like to get the opportunity to dance, so this series continues to fuel their dreams. This entry was posted on January 8, 2016, in Ballet and Dance, Friendship, Novel, Older Readers, Review. Broadway Baby and Lights, Camera, Action are the latest additions to the Silver Shoes series which follows the early dancing days of a group of friends at the Silver Shoes Dance Studio. Each girl has her favourite genre and this time it is the turn of Ellie and Ashley to shine again. Since her success in And All That Jazz, Ellie has been taking singing lessons and now she is determined to wow them in a Broadway musical and become a ‘triple threat” – one who can act, dance and sing. However, her strength is jazz ballet not tap dancing and there are those who are better than she also auditioning. Meanwhile, in Lights, Camera, Action hip-hop lover Ashley is now inspired by reggae and is desperate to impress an agent looking for the star of his next music video. But, as with the others in this series, there are those who are determined to be better than the heroine so like Ellie, Ashley has to dig deep into her inner self to persevere and test herself. Dancing remains one of the most popular sports for Australian children and so it’s no wonder that this series has been a hit with so many of the young girls I know. Once again, the author’s expertise shines through and while the key focus is on the dancing element, she still holds a mirror to the life of this age group who are branching out into new ventures and friendships as they try out new independence. Each reader sees herself as the lead character on the stage but can also relate to the challenges that have to be faced to get there. I know these will be snapped up as soon as they appear – here’s hoping there are more in the pipeline! This entry was posted on October 25, 2015, in Ballet and Dance, Friendship, Novel, Older Readers, Review, Self Esteem, Stepping Stone. It’s Saturday night and there is a great sense of anticipation in the line-up at the door of the disco. The doors, open, the crown surges, music starts to pump… and the dinosaurs surge into the hall! Each has their own unique style – styracosaurus salsa, corythosuarus crumps and maisaura moonwalks across the shiny floor – but it doesn’t matter because each is having fun and loving what they are doing. With the disco ball and lights flashing, the conga line snakes across the floor until the music stops, the ground begins to shake, there’s an eerie silence and some of the little dinosaurs dive for cover. What could have cast such a pall of gloom over the fun and frivolity? If you looking for a raucous, rollicking book that young dinosaur lovers can really get into, then this is perfect. In their amazing way, they will get their tongues around the difficult and unfamiliar names and will move and groove with the dancers. They will hold their breath when the intruder arrives but delight in the ending, joining in with great gusto. Dinosaurs are perennial favourites with young readers – and they can never get enough of them. Whether it’s fiction or nonfiction, old and new titles are eagerly sought and this one combines the best of both worlds as there is a pronunciation guide as well as some fast facts about the champions in the book. Bright illustrations add to the appeal and while somewhat stylised they are close enough to the child’s perception of each species, they will delight in being able to identify them. Definitely one for the collection but it needs to have some loud music going to get the atmosphere happening for a memorable storytime. This entry was posted on October 17, 2015, in Animal Stories, Ballet and Dance, Boy Appeal, Dinosaurs, Picture Book, Preschool, Review. Silver Shoes Dance Studio is a dance academy where 10 year-old Eleanor Irvin and her friends go three or four times a week to learn to dance. Jazz, tap, ballet, hip-hop, ballroom, lyrical – whatever the style it’s on offer and each girl has her favourite genre. In the first two titles in this series – And All that Jazz and Hit the Streets – the focus was Eleanor and her love for jazz ballet and then Ashley and her desire to excel at hip-hop. The latest two additions to this popular series focus on ballroom dancing and ballet. In Dance Till You Drop Paige struggles with trying to meet her mother’s expectations that she will be the best dancer ever and pushing her into extra classes and her body and head telling her she needs to take a break. It’s not till she doesn’t turn up at class and her friends find her hiding that things come to a head, particularly when Ellie asks her “What’s more important? Your mum being a bit upset when you tell her or you being like a zombie all the time and running away from class?” It takes a while but her love to dance is questioned and answered in a story many will see themselves in, in one way or another. Ballet is the focus of Breaking Pointe and Riley has to make choices between her love of it as well as her love of all sports, including athletics and basketball, especially when she finds she has a clash of commitments. This is another situation familiar to many young people as they try new things to find their passion and begin to understand they can’t do everything. This series has proven very popular among the girls at my school who are fascinated with all things dance and it is perfect for moving them on beyond the heavily illustrated early chapter books as they continue their reading journeys towards independence. They are going to be delighted to see these new additions to the series and know that there are two more coming in October! Click here for a review of the first two in the series. This entry was posted on August 5, 2015, in Ballet and Dance, Friendship, Novel, Review, Series, Steph's Book Box.